I have been busy getting ready for Convention. Lots of things I signed up for aand now its a frantic scramble to finish off my projects. Also, I promised my friend Jen I'd make her baby announcements so-been working on those too. Card #1 is the version I made for Jen. 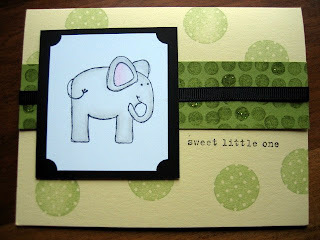 Its a variation on my previous elephant card. canged up the colours. Bkg cardstock is barely banana. I paired it up with old olive. Used a corn stamp to make the background and coloued in with stickles. Card#2 is my Wow! Shaker card for convention. The stamp set is a new set from the Stampin'Up! catalogue called Punch Pals. The penguin is watercolored and embossed with Iridescent Ice EP. This was a rea lly fiddly card- cannot see myself making lots of them for anyone. But it is a very cute card. 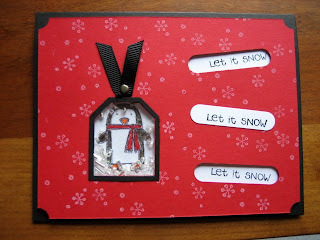 I went punch crazy on this one- used the small and regular tag punch, as well as the word window punch and the ticket corner punch. Paper used- real red, black and whisper white cs. Card#3 is one I made for floor swaps. I am on a masculine kick lately. I like the clean lines of this card. I used River Rock cs (yaay! It's one of the new In Colours for 07/08 and I *love* it very much). It has a slight olive underone and is a chameleon as it looks different with different colours. Since I didn't have River rock ink, I used Sahara Sand ink on it and it works- the background is stamped with flannel bkg (also Stampin'Up!, of course!). 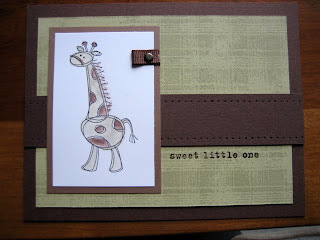 The base is chocolate chip and the giraffe is a stamp from a newish set, called Bundle of Joy. I used reinkers and an aquapainter pen to watercolour the image. It's easy peasy watercolouring.I matted the giraffe with close to cocoa and the sentiment "sweet little one" is embossed. Card# 4 is an ATC. 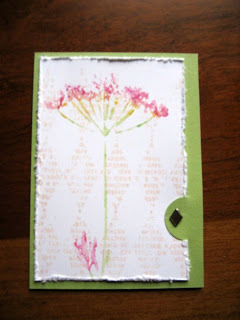 Hero Arts Dill which I used my watercolour wonder crayons (also Stampin'Up!) --- love this very much!!.... bkg is an unmounted stamp I got from Catslife Press (Dictionary Diamonds) which I stamped in blush blossom ink. The watercolour wonder crayons work best on solid image stamps. I took my aquapainter filled with water, ran it over the stamp and then used the individual crayons to "colour" or scribble over the moist surface of the stamp. It really gives a watercolour feel to the image. Posted by Diane aka cameldiva at 5:12 p.m.